Review posted September 2, 2015. This is another book about Universalism. 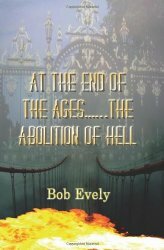 And Bob Evely summarizes the case beautifully that, at the end of the ages, God will save everyone. This book is for those who believe the Bible is the Word of God, for people who don't believe all will be saved because they don't believe the Bible teaches this. Never mind what's logical -- they think universalism is contrary to Scriptures. Every single Greek word was closely examined. Each word was studied in every occurrence within the New Testament to determine the best English equivalent to be used. As much as was possible the meaning for each word was determined from the way the word was used within the New Testament, and not how other human authors may have used the word. To preserve distinctions made by God, each individual Greek word was matched with a unique English equivalent. The same English word was not used for different Greek words, and differing English words were not used when a single Greek word was used. Ephesians 2:7: "that, in the oncoming eons, He should be displaying the transcendent riches..."
Colossians 1:26: "the secret which has been concealed from the eons and from the generations, yet now was made manifest to His saints..."
Matthew 13:22: "...the worry of this eon and the seduction of riches are stifling the word..."
I Timothy 6:17: "Those who are rich in the current eon..."
John 14:16: "...and He will be giving you another consoler, that it, indeed, may be with you for the eon..."
Revelation 11:15: "The kingdom of this world became our Lord's and his Christ's, and He shall be reigning for the eons of the eons!" Matthew 13:39: "the conclusion of the eon"
I Corinthians 10:11: "the consummations of the eons"
Now, the author adds plenty of commentary to these quotations. To me, he clearly points out that it's inconsistent to translate aion as "eternal." While I have not attempted to show how many specific eons are mentioned in Scripture, I have desired to show that there are distinct, separate eons (or ages) that are mentioned in God's Word. These "eons" are periods of time with a beginning and an end. There was a time before these eons began. There will be a time when all of the eons will come to an end. We have seen at least three distinct eons referred to in God's Word. If an earthly ruler condemned even the vilest criminal to be kept alive just to be tortured forever, we would shudder at his cruelty. But we have inherited the current orthodox teachings about God that calmly attribute such activities to Him, while also teaching that He is a God of love. I have come to see that the Bible does not teach this at all. Man has intervened and has placed his philosophies and pagan ideas within the Word of God. The modern English translations now perpetuate these man-made ideas, primarily because of a few words mistranslated and misinterpreted. We see a God of love, but a God who is also very harsh. Some say this is necessary because of God's holiness and justice, but is God not able to use His love and power to bring about justice without losing a single sheep from the fold? On a more positive note, he then looks at the "all" passages in the New Testament, as well as looking at I Corinthians 15:21-28, which talks about the "consummation." This is the grand conclusion of the ages. God has taken what mankind (and Satan) have intended for evil, and He has used it to achieve good. He has operated all in accord with the counsel of His will to achieve His will... that ALL mankind be saved. Some have recognized the greatness of God, and the work of the Saviour, in this lifetime, by faith. Others have taken longer, but now find salvation also. Every knee is now bowing in subjection before Him. Every person has found salvation. Every lost sheep has been found. The purpose of the eons has been achieved, and God is now All in all. Another section of the book looks at the testimony of church history -- the ultimate reconciliation of all things is by no means a new view -- in fact, history shows us that this was the dominant view of the early church until Augustine. I like this book, because as Bob Evely describes how he came to believe God will save everyone, his process pretty much mirrors mine. I, too, thought I couldn't believe it because the Bible didn't teach it. I was amazed and delighted to take another look and learn that maybe I'd been misled as to what the Bible actually says. And I was also surprised to learn of the deep historical tradition behind this view. Having been exposed to the things I have presented in this work, at the very least you should be hoping and praying that these things are true. Not wanting to be led astray, this is where I began. I had been taught my entire life that there was a place of eternal torment. When I first heard of the possibility that this was wrong, I was highly skeptical. I did not want to be led into falsehood. But as I journeyed down the path, studying and thinking of these things I had never been taught by a teacher or a pastor, I came first to a place where I did not know if these things were true, but I certainly hoped and prayed that they were! How can we not feel this way? To think that there really is hope for those of our loved ones who died outside of Christ! Can God's grace really be that big? Can His love really go that far? Is He really that wise that He could figure out a way to save all of mankind, despite rebellion and sin and wickedness and rejection? This is a good place to start. The things you have read in this book have been largely suppressed, at least since the 5th century. When Universalism was declared by "The Church" to be heresy, many of the writings in support of this doctrine were destroyed. "The Church" was wrong, and today we live with the results of that error. At least begin by hoping and praying that these things are true. Read and study the Word of God with this new possibility; this new perspective. Test this theory, this theology. Don't believe me, but study and think for yourself. I think as you go forward you will see the wonderful grace of God at every turn. It is a grace that is greater than anything mankind could ever have hoped for! And this book is a wonderful resource for that search.